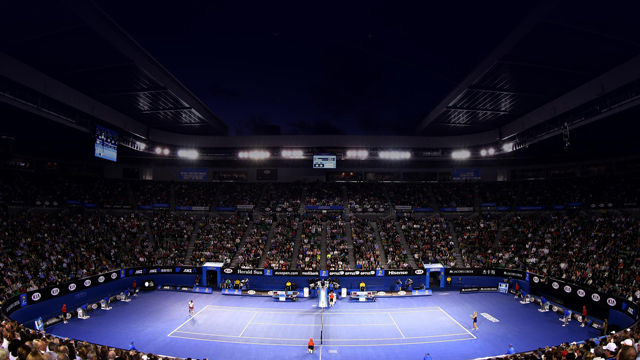 Australian Open – Follow the Tennis match between Novak Djokovic and Daniil Medvedev live with Eurosport. The match starts at 08:00 on 21 January 2019. Our live coverage lets you follow all the key moments as they happen. Head-to-head: see historical stats and visit our detailed profiles for Novak Djokovic vs Daniil Medvedev. Get all the latest on Tennis: fixtures, results and tables. That's Djokovic's tenth Australian Open quarter-final. DJOKOVIC 6-4 6-7 6-2 6-3 MEDVEDEV: Djokovic can, though, and does - to 30, to wrap up what's been a gruelling encounter for both men. Medvedev is angry. Mostly with his racket, which won't break. DJOKOVIC 6-4 6-7 6-2 5-3 MEDVEDEV: Medvedev does still have a walloping forehand in his locker, and he moves to 30-0 before Djokovic takes three straight point to resume the lead. DJOKOVIC 6-4 6-7 6-2 4-3 MEDVEDEV: But Medvedev is throwing everything at Djokovic here - time is running out and he might as well give it all he's got. DJOKOVIC 6-4 6-7 6-2 4-2 MEDVEDEV: Remember Djokovic is a six-time champion here, although not since 2016. Lots of first serves off-target here, and he has to save break points again. DJOKOVIC 6-4 6-7 6-2 3-2 MEDVEDEV: It's been Djokovic with the quicker service holds in this match, but Medvedev races through that. But then the Serbian knows that all he has to do now is hold serve three more times and he's in the quarter-finals. DJOKOVIC 6-4 6-7 6-2 3-1 MEDVEDEV: Djokovic backs it up with a hold. Now, we already know that Medvedev can come back from a deficit...but this may be too much for him now. DJOKOVIC 6-4 6-7 6-2 2-1 MEDVEDEV: When it comes to the rallies, both men look tired. But then it's past midnight now so that's not surprising. Djokovic has the psychological edge, though, and compounds that with an early break of serve in this fourth set. DJOKOVIC 6-4 6-7 6-2 1-1 MEDVEDEV: That's a really hard-fought hold of serve. Medvedev is straining every sinew and he's helped by the fact that Djokovic is not playing flawlessly. DJOKOVIC 6-4 6-7 6-2 0-1 MEDVEDEV: Djokovic's game plan has been to ride it out and grind Medvedev down, but the Russian comes out at the start of the fourth with gritted teeth. Hold to love. Those break points saved seem to have completely turned this match around. Medvedev has no answers and Djokovic is comfortable..
DJOKOVIC 6-4 6-7 6-2 MEDVEDEV: That's the set. DJOKOVIC 6-4 6-7 5-2 MEDVEDEV: Djokovic steps in, and brings out an inside-out forehand winner. Yeah, that's going to help you break serve of a very tired man. The world number one is trampling all over Medvedev now. DJOKOVIC 6-4 6-7 4-2 MEDVEDEV: A swift hold to love for the top seed. There doesn't seem to be very much left in Medvedev's legs. DJOKOVIC 6-4 6-7 3-2 MEDVEDEV: Djokovic with the momentum! He took a spill earlier in the set but that hasn't shaken him, and that fightback from three break points down helps him here. That's a really significant hold, one feels, saving three break points to stay level in the third. DJOKOVIC 6-4 6-7 2-2 MEDVEDEV: Battling tennis from Djokovic, coming back from what seemed a certain break to levelling at deuce. DJOKOVIC 6-4 6-7 1-2 MEDVEDEV: Djokovic does still look like he is putting pressure on Medvedev's serve, pushing him to deuce, and though he is making mistakes still he doesn't seem too upset by them. DJOKOVIC 6-4 6-7 1-1 MEDVEDEV: A straightforward hold will go some way to settling him down, one would expect. DJOKOVIC 6-4 6-7 0-1 MEDVEDEV: Medvedev holds to open up this crucial third set. Basically that second set ended with Djokovic being outfought in those lengthy rallies, just tiring at the last shot. Not like him at all. DJOKOVIC 6-4 6-7 MEDVEDEV: Wow! Medvedev races to a 3-0 lead and Djokovic has no answers at all for him. It looked like the Russian was the more tired of the pair 15 minutes ago, but that's not the case now - 7-5 in the breaker. DJOKOVIC 6-4 5-5 MEDVEDEV: Medvedev tries a drop shot against Djokovic, and the world number one takes the chance like candy from a baby. But that isn't enough and it's a breaker. Oh, sounds like the trainer has been called for after this game. More when I see it. Medvedev now has to serve to stay in the second set for a second time. DJOKOVIC 6-4 6-5 MEDVEDEV: Incredible foot speed from Djokovic, and he's not dwelling on letting that massive lead slip. DJOKOVIC 6-4 5-5 MEDVEDEV: Bad challenging from Medvedev and some evident signs of frustration. Even so, he gathers himself to hold, and Djokovic is looking a little frustrated too. DJOKOVIC 6-4 5-4 MEDVEDEV: A minute-long service game. DJOKOVIC 6-4 4-4 MEDVEDEV: Interesting. Back to four-all in this set, after Djokovic looked like he was going to canter it. DJOKOVIC 6-4 4-3 MEDVEDEV: The rallying has been so interesting to watch in this match; neither is reliant on speed because they know that won't wash, they're trying the element of surprise. Medvedev catches the world number one out here. DJOKOVIC 6-4 4-2 MEDVEDEV: Big serving from Medvedev, which he really needed. New balls for Djokovic, who's also picking up a new racket. DJOKOVIC 6-4 4-1 MEDVEDEV: Djokovic takes to his seat and covers his legs with a towel, well satisfied here. He's playing well, and using variety to bamboozle Medvedev. DJOKOVIC 6-4 3-1 MEDVEDEV: Some more tremendous rallying, with Djokovic mixing it up with some slices to break Medvedev. DJOKOVIC 6-4 2-1 MEDVEDEV: Liking the Djokovic surprise tactic of springing into the net to deceive Medvedev; he has more success with it here. One hour gone. DJOKOVIC 6-4 1-1 MEDVEDEV: The fifth break point leads to the best rally of the match, with Djokovic switching up his power, and Medvedev spotting the best angles. In the end the Russian holds serve after 13 minutes. DJOKOVIC 6-4 1-0 MEDVEDEV: This is a lovely hold from Djokovic, who's moving very well, coming courageously into the net and enticing the Medvedev errors. DJOKOVIC 6-4 MEDVEDEV: Crunching forehand with topspin from Djokovic to take it to deuce, and he keeps his focus to extend the rallies and smash the Medvedec service game, taking the set. DJOKOVIC 5-4 MEDVEDEV: Now then. That's a break back for Medvedev, although Djokovic saves one break point and benefits from a net cord during an epic rally. DJOKOVIC 5-3 MEDVEDEV: A hold to love for Medvedev, so Djokovic has the chance to serve it out. DJOKOVIC 5-2 MEDVEDEV: Djokovic is going after the Medvedev backhand and is having some success. DJOKOVIC 4-2 MEDVEDEV: That's the early break for Novak Djokovic. Medvedev may well come to regret not capitalising on his chance in the last game. DJOKOVIC 3-2 MEDVEDEV: There's a sharp intake of breath as Djokovic returns into the net two points in succession, giving Medvedev break point. He saves it with a tremendous rally, coming into the net to volley it short, and eventually takes the game with an ace. DJOKOVIC 2-2 MEDVEDEV: Medvedev keeps hold of his serve, but Djokovic is certainly going toe to toe with him at the moment. DJOKOVIC 2-1 MEDVEDEV: The umpire replaces his microphone and gets an ovation for having an amplified voice. Hold to love for Djokovic. Oh, the chair umpire doesn't have a working microphone, and he's just shouting. Hilarity ensues. DJOKOVIC 1-1 MEDVEDEV: And a hold for Medvedev too. Quiet and reasonably jovial atmosphere around the court. DJOKOVIC 1-0 MEDVEDEV: A very strong service hold to love for the world number one. Fifteenth seed Medvedev, meanwhile, hasn't dropped a single one. Djokovic has dropped just one set so far this week. Hello and welcome to our LIVE coverage of Novak Djokovic against Daniil Medvedev.